Wireless networking has exploded in terms of popularity and wireless networks are popping up everywhere. At the PCStats test labs I can detect eleven wireless networks (three of which have no security) and at home there are fourteen! It's nice that ECS recognizes this and include a wireless USB 802.11g network adapter along with the PF88 Extreme Hybrid motherboard. Along with the small USB wireless network adapter is a docking port which is 182cm (six feet) in length, very handy since it allows users to place the wireless USB NIC in a higher position which should improve the network signal. Also considering how cluttered the back of the PC gets, it's nice to move the NIC elsewhere and not simply add to the confusion. The USB NIC uses the ZyDAS ZD1211 USB chipset, and according to ZyDAS the chipset is 802.11a/b/g compatible although ECS and the accompanying utility only lists 802.11b/g. 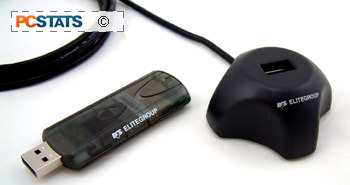 Installation of the ZD1211 USB wireless network card was very easy; simply plug it into the USB slot or docking port and the computer will detect a new piece of hardware. Install the driver and accompanying software via the driver CD and you're set. By default the ZD1211 supports WEP64, WEP128, WEP256 as well as the more advanced WPA form of wireless encryption. If desired, a user could also use the wireless network card as an access point or bridge to extend the size and range of the network. Currently only Microsoft operating systems (XP, 2000, ME and 98) are officially supported, but there are open source driver projects for alternative operating systems. When we click the 'More...' button on the first menu we get this window. From here we can set/change the WEP or WPA encryption settings as well as set wireless profiles which make things easy should you connect to many wireless LANs.